"You Did It! Thank You And Well Done!" The memorial fund has reached its target of £21,128 thanks to a remarkably generous donation of £2,000 in memory of Sgt Tom W Edwards, 637669, RAF Servicing Commandos, Unit 3207 and the Redhill Bomb Disposal unit. The donation is also in remembrance of all the comrades with whom he served over several years. 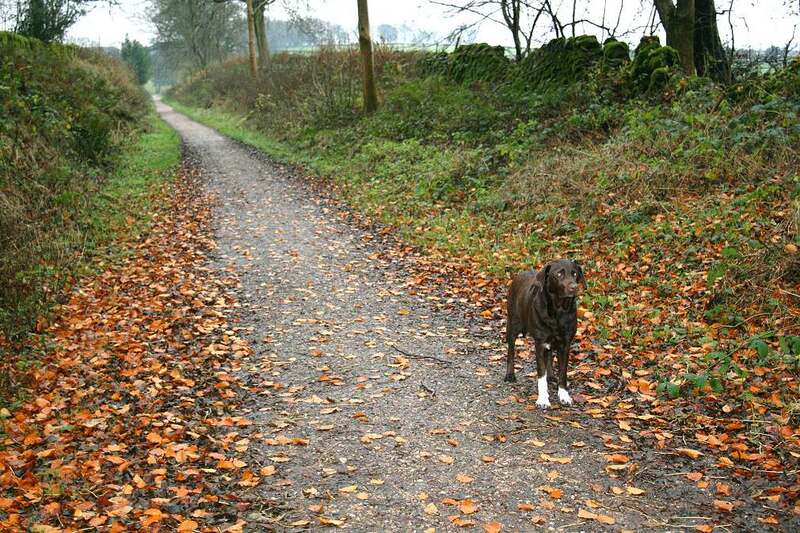 The memorial fund was set up in 2006 when there was no design, no plot on which to build and no money! It was an act of faith, or folly, depending on your point of view! From the outset donations came in from around the world, which provided the motivation to see the project through, despite the inevitable disappointments and difficulties along the way. Those who attended the dedication ceremony in July 2013, were privileged to meet many veterans who served in Combined Operations. It was more like a family gathering than a stuffy formal occasion. Everyone had a good reason to be there and it was a joy to see so many happy faces engaged in animated discussions before and after the dedication ceremony in the refreshments marquee. The ceremony itself covered; (1) the history of the memorial project, (2) this website as the educational element and (3) an excellent historical perspective from General Barrons, Commander of the Joint Forces Command - the modern day equivalent of the Combined Operations Command. The mood became sombre and reflective as the memorial was dedicated and the laying of wreaths commenced... and tears were shed, as the memories of fallen comrades flooded back. Those who were there will never forget it. To everyone who donated money, supported the project in any way or contributed to this website, I thank you on behalf of the millions who have used the website and the many hundreds who have visited the memorial. You did it! Thank you and well done! 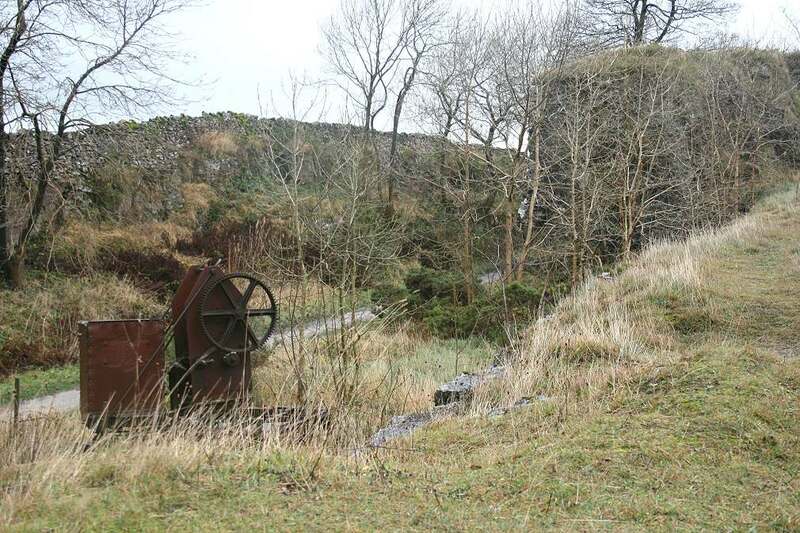 A new fund has been set up to cover on going maintenance and future development costs of the memorial. The balance from this fund has been carried forward to the new one. If you wish to contribute to this, please click the "Donate" link in the page banner above. Below there's information on the fund raising wall, a summary of accounts and details of past fund raising events. These archived records will remain published on this website as testimony to the magnificent effort of so many people. Bricks in the donations wall below, with initials or names, gratefully acknowledge receipt of single donations of £50.00 or more, as in the case of larger bricks. Such donations will normally acknowledge the name of the donor but can be made anonymously, in memory of a veteran, unit, landing craft etc. Operations training establishment near Poole, Dorset. For over 10 years, Gloria has supported the project over many years. 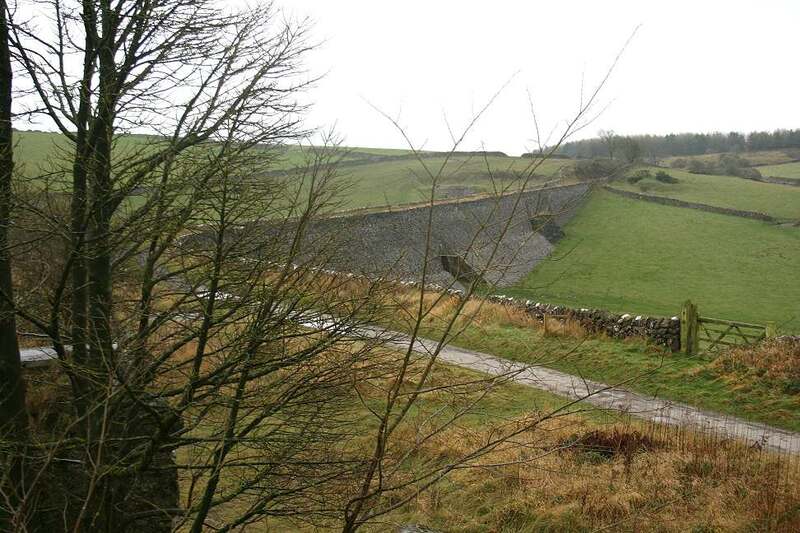 £350 of incidental expenses incurred during the construction of the memorial, written off by Geoff Slee. £500 of incidental expenses incurred during the construction of the memorial, written off by Geoff Slee. RN Beach Signals Unit 6 Daniel George Hawes JX315161. KIA on LCT 390 - 8/6/44. £400 of incidental expenses incurred during the construction of the memorial, written off by Geoff Slee. £200 from Combined Ops Membership fees. Daniel George Hawes JX315161. KIA on LCT 390 - 8/6/44. Lt D Adshead-Grant, RNVR, designer of the Combined Operations badge. Donated by his grandson, Ed Adshead-Grant. £500 donated by Keith Quinton in honour of his father, veteran Arthur R Quinton. Memberships Ellen Kerr IMO Sub. Lt. Hector McIntyre. A/B George McGrann, R N Commando Norman R Mitchinson RCNVR ComOps Memberships Ron Croft LCT 383. Juno 6th June 1944. R E Giles Bill Newell, W Commando, RCNBC £150 from Combined Operations Membership fees. L'g Seaman V F Peter Manning COPP6 £100 from Combined Ops Membership fees. Army Commando £150 from Combined Ops Membership fees. 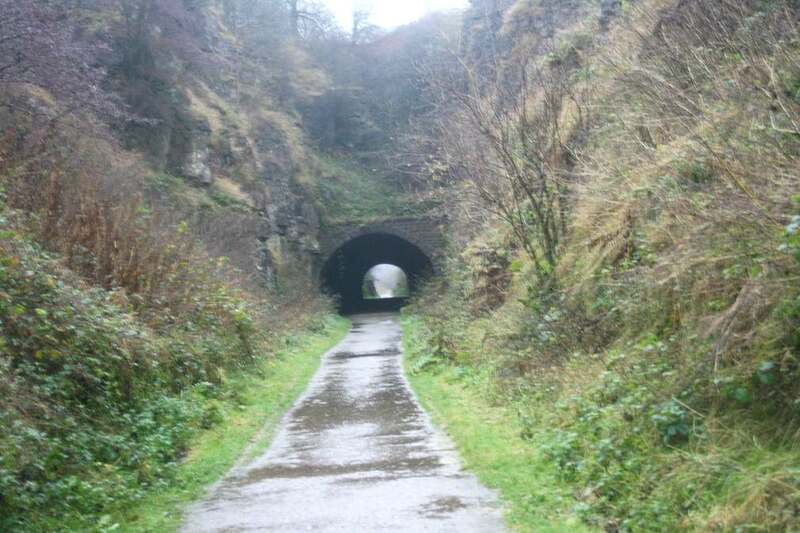 Richard Stimpson - 7 mile backwards walk. Information below. Commando March (G T Parton) £300 - Bonnar Quarries, Loch Fyne, Scotland, donated four large stones for the memorial amounting to around 16 Tons. The entry here is to acknowledge their generosity. No monetary value attached to this entry. 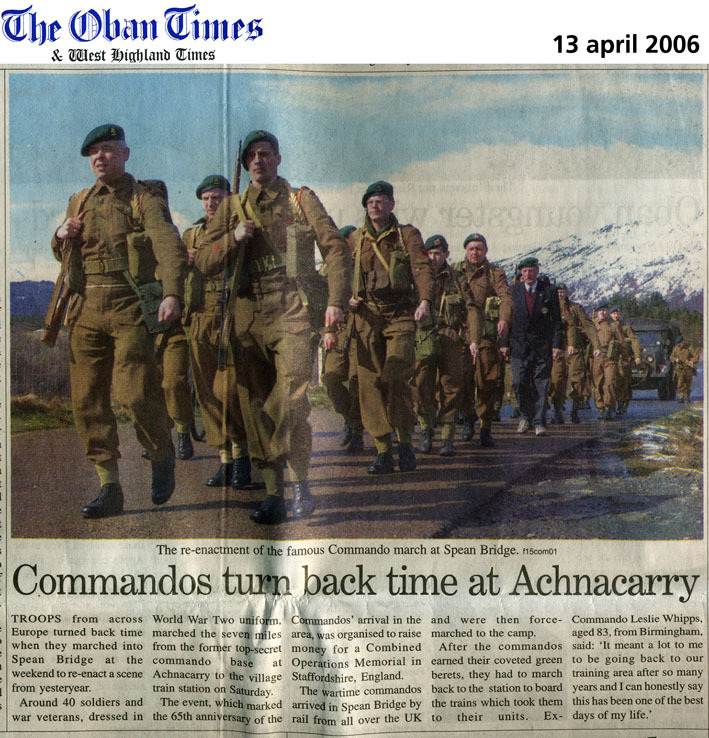 Commando Re-enactors Commemorative March Achnacarry to Spean Bridge April 2006 £100 - Black Watch Association in support of Commando March. This did not materialise so no monetary value attached to this entry. £500 from Combined Ops Membership fees. 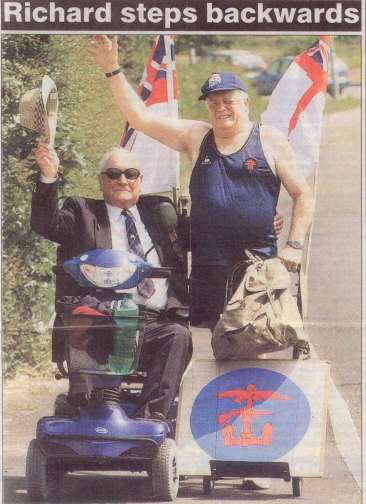 Fl/Sgt John Glen 976168 RAF Radar £400 from Combined Ops Membership fees. Fl/Sgt John Glen 976168 RAF Radar B.O. B.O. 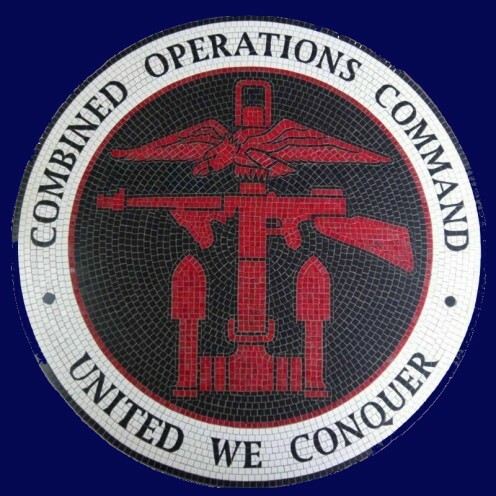 Combined Ops Membership fees. £500 from LAC. 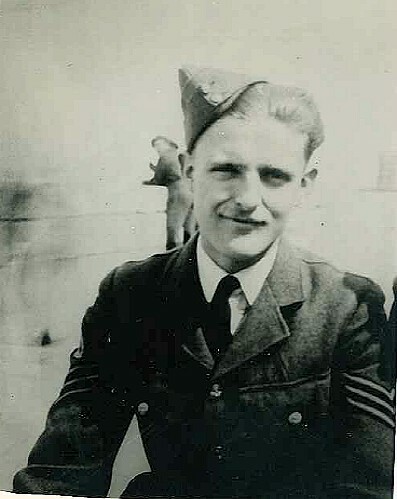 R Karl Work, 160415, Royal Canadian Air Force, served with RAF on board FDT 217. £100 from Combined Ops Membership fees. A.M. P-R Prof Arthur Quinton (USA) S. Brouchoud. In Memory of Fl/Sgt John Glen 976168 RAF Radar aboard FDT 217 £100 from Combined Operations Membership fees. For simplicity the pence have been rounded up or down as appropriate. The long term maintenance and development of the memorial and its associated website www.combinedops.com (this website if you are reading this directly) will most likely, in time, become the responsibility of a charitable trust that glories in the name of a Scottish Charitable Incorporated Organisation (SCIO) under the auspices of the Office of the Scottish Charities Regulator (OSCR) at www.oscr.org.uk/. The website is the educational component of the memorial. It will certainly consume time and money to maintain and develop as will the physical memorial. The aim of the SCIO will be to perform routine housekeeping tasks, to maintain and develop the website content and to provide an advice and information service by e-mail and Facebook. Hopefully, such arrangements will be in place for a number of years before the present holder of the baton feels the need to pass it on. Depending on the knowledge, skills and experience available to the SCIO on a voluntary basis, it may be necessary to outhouse the administrative and maintenance work of the website. The SCIO will likely investigate the availability of grants from the Lottery fund and other funding bodies should this become necessary. The memorial fund will remain in existence to fulfil ongoing commitments and obligations. 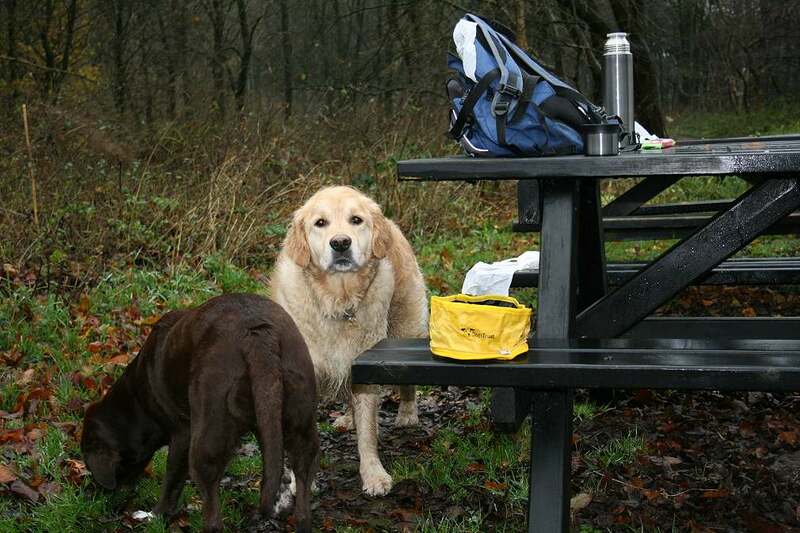 New banking arrangements will be set up for the proposed SCIO as a registered charity. The Combined Operations Military Button Badge, opposite, is unique tribute to The Command and will be auctioned at Marlow's Military Auctioneers of Stone, Staffordshire on August 19th with the proceeds going to the Combined Operations Memorial Fund. The badge is offered for sale by Terry Carney. We sincerely thank Terry for his generosity. The Badge was made by Terry in 1992 around the time he was researching an article on "The Combined Operations Badge 1942- 46." 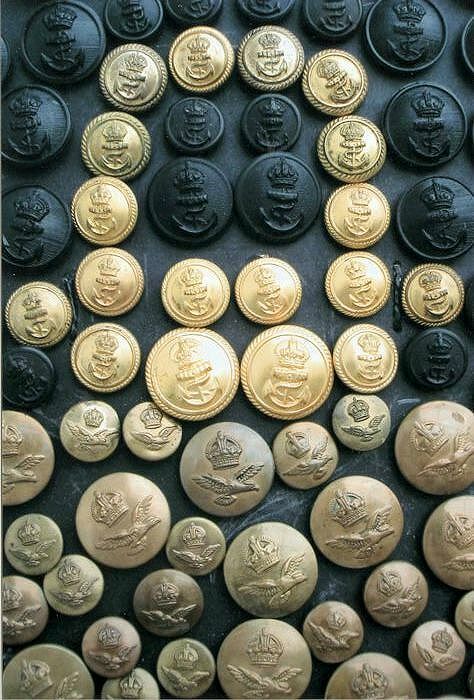 The badge is 780mm (31 inches) in diameter and is made from over 1,000 Military buttons from the Army, Royal Air Force and Royal Navy. 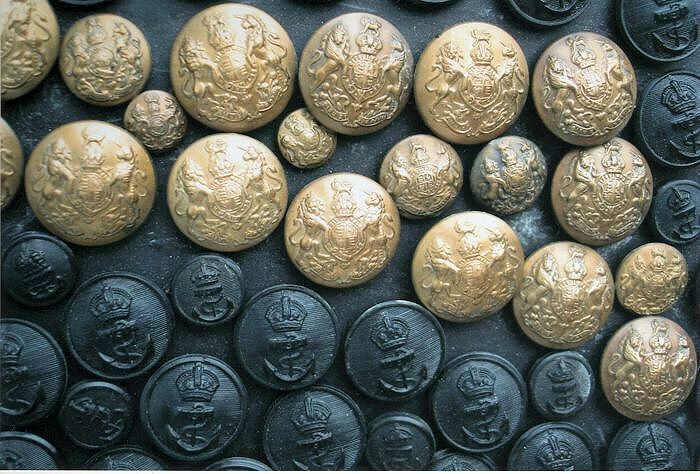 The use of buttons from the three services provides a strong symbolic association with Combined Operations that extends well beyond the image itself. 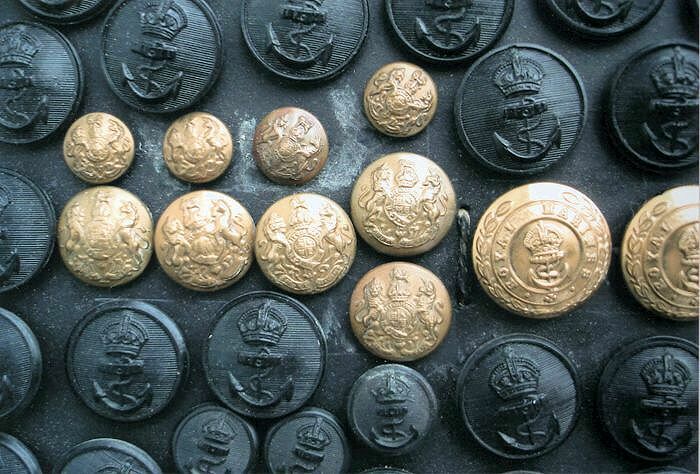 The outer row comprises khaki coloured General Service buttons, the second row Royal Navy black plastic buttons and the third row black RAF plastic buttons. 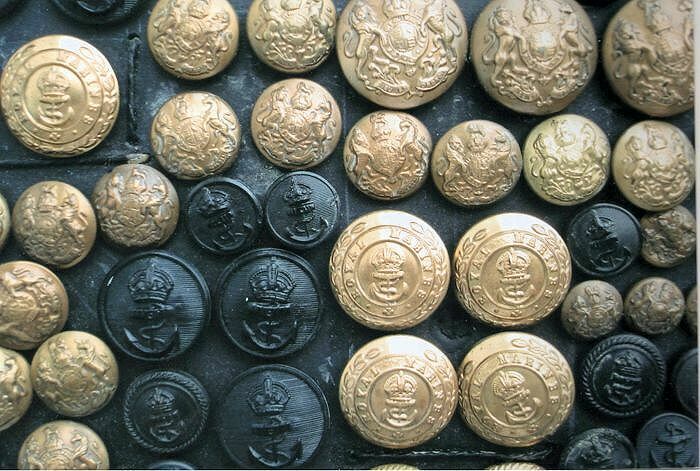 The Eagle is made of brass R A F buttons, the anchor gilt Royal Navy Officers buttons, the Tommy Gun brass Army General Service and brass Royal Marine buttons. 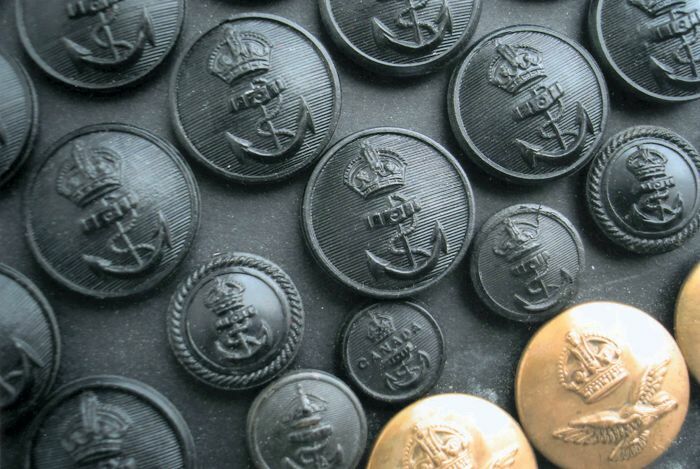 The background consists of Royal Navy black plastic buttons. The buttons were originally fixed on black card by pushing the button loops through the card and securing them in place with string. Later it was mounted on a wooden board to provide better support. 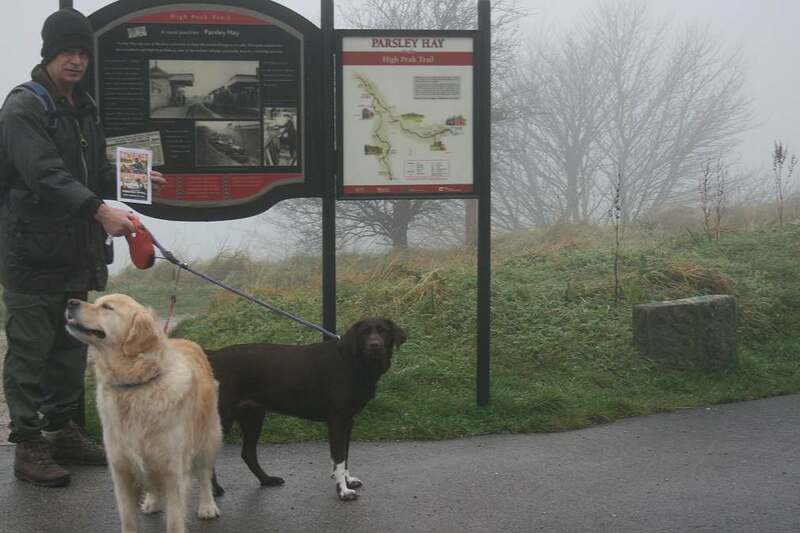 Ian Carrington and his two dogs, Bailey and Lucy, successfully completed their fund raising walk on Saturday November 21st 2009. 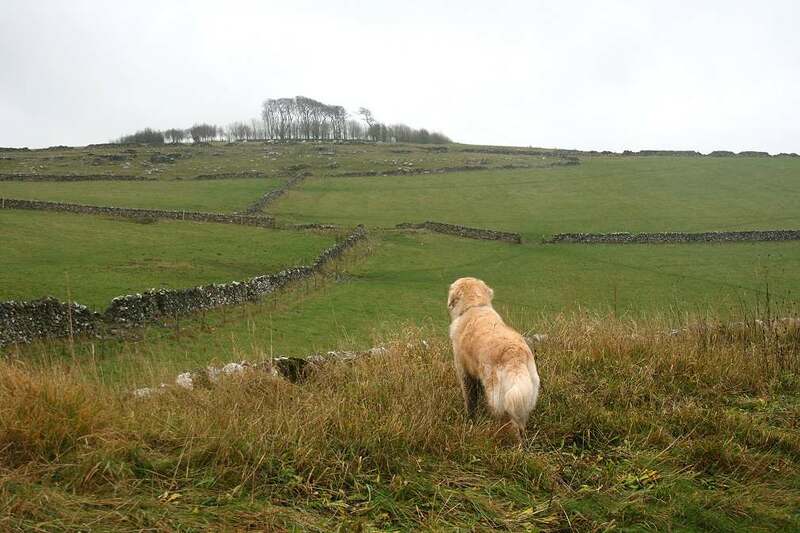 The weather was challenging with mist and rain at times and heavily laden skies throughout. 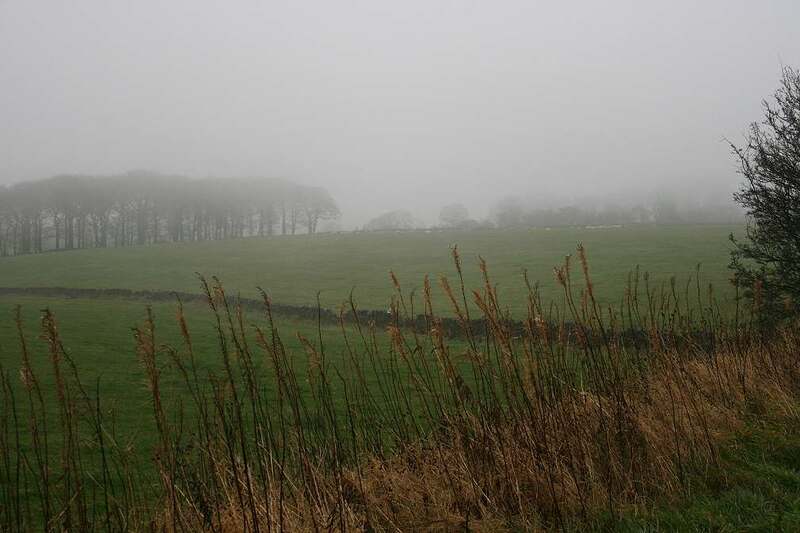 Despite this, the beauty of the Derbyshire countryside can be seen in the photos below taken along the High Peak Trail. Donations received from local supporters and as far afield as France and the USA, totalled an impressive £1044.67. 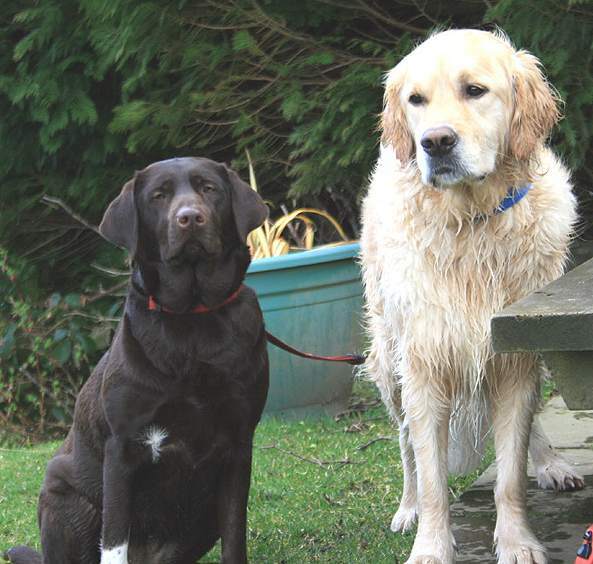 Many thanks to Ian, Bailey & Lucy and all who supported Ian's fund raising walk. It's an old cliche but your donations really will make a difference. Pre Walk Information. 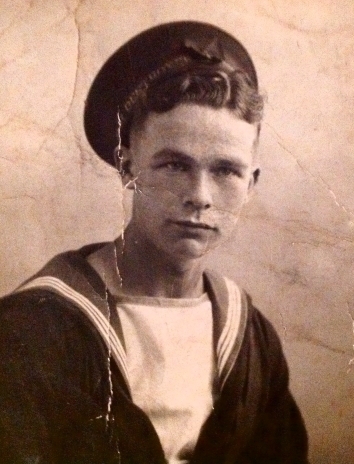 Ian Carrington's father, leading seaman John Carrington (CJX355012), served on the Destroyer Duncan before serving under the Combined Operations Command on Landing Craft Flak 18. Then in 1944, as Coxswain of Landing Craft Tank 820, he was involved in the Italian landings and the D Day landings. Now in his 85th year, he is still very much with us but, sadly, one of a dwindling band to whom we owe so much. 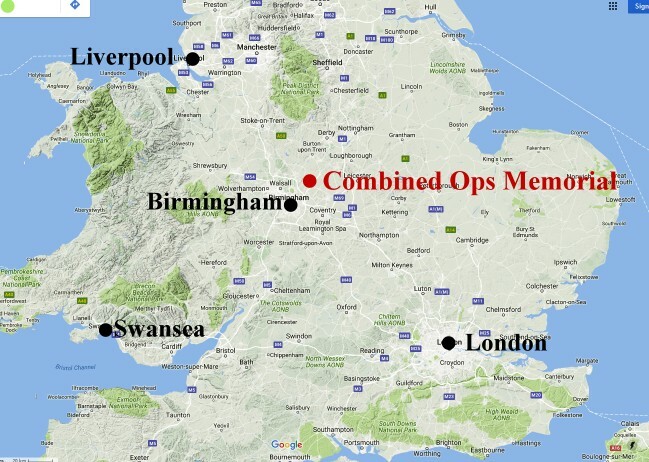 In honour of his father and the many thousands who served in Combined Operations, Ian will undertake a 20 mile walk in aid of the Combined Operations Memorial Fund. A unique fund raising event by Royal Navy veteran, Richard Stimpson of Staffordshire, put money in the coffers of the Combined Operations Memorial Fund (see donations wall above) and the War Memorials Trust. We are greatly indebted to Richard and his friends who made the day such a success. What did Richard do? He walked backwards for 6 miles!! Click on the photo for more information courtesy of the Wolverhampton Express and Star. 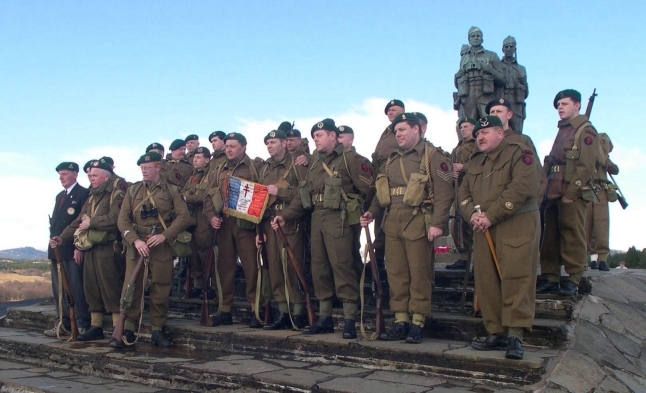 A number of re-enactment groups from the Netherlands, France, England, Wales and Scotland joined forces with this website, the No 3 Commando Re-enactment Group and the Combined Operations Association, to raise funds for the Combined Operations Memorial. We are indebted to Patrick van der Vegt of the No 10 (IA) Commando Re-enactment Group, located in the Netherlands, for organising the event. In the finest spirit of Combined Operations the march was an international operation. The event raised £1500.00 from veterans, individuals, organisations and associations with an interest in Combined Operations. 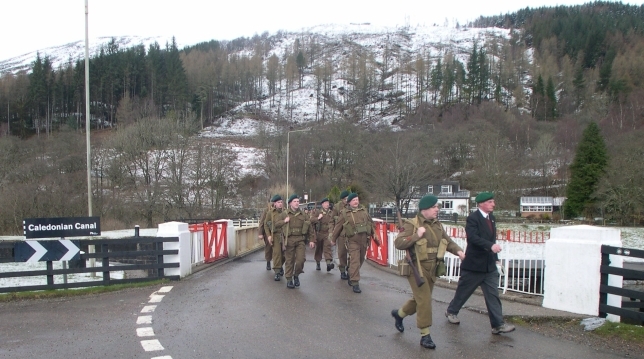 The 7 mile march started at Achnacarry, in the Highlands of Scotland, where WWII Commandos undertook their gruelling training under the immediate scrutiny of the legendary Col Charles E Vaughan. 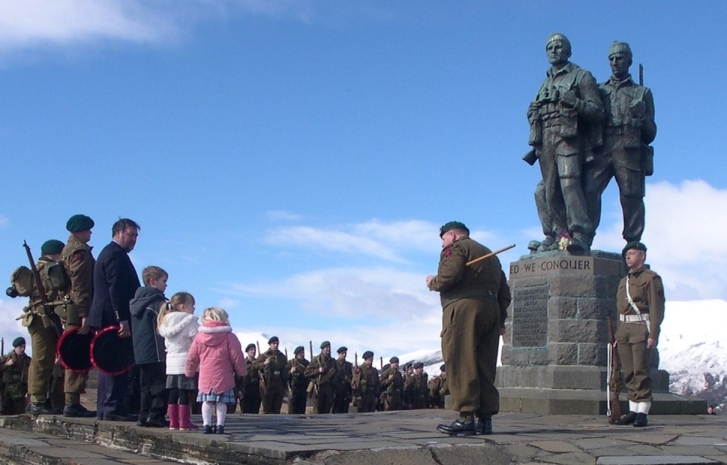 The route passed the Commando Memorial at Spean Bridge where a wreath laying ceremony was held. To see the route of the march click on the thumbnail opposite. Below you'll find a small selection of photos taken on the day, articles from the media together with a link to around 300 other photos taken by the march's official photographer, Kees Huyser. 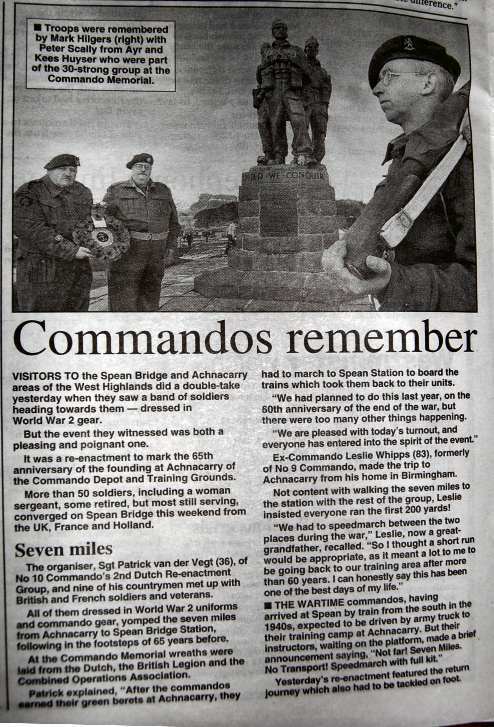 Lochaber Life Magazine featured the Commando March in their November 06 edition. 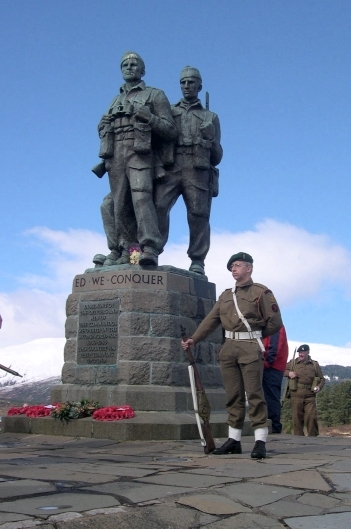 Achnacarry House, the Commando Memorial and Spean Bridge are all within the Lochaber district. 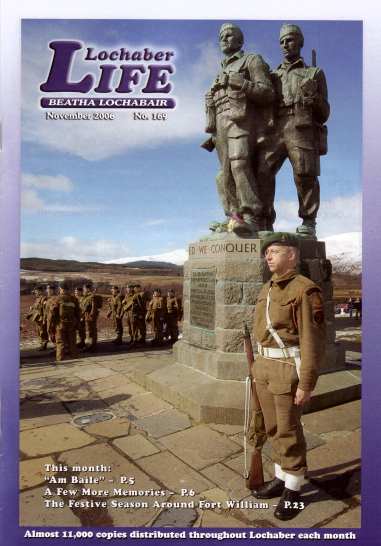 Around 11,000 copies of the magazine were distributed mainly around Lochaber. Copies were generously provided by the publishers, Scottish Provincial Press Ltd., for distribution to all who took part in the march. Courtesy of the Oban Times - a west of Scotland newspaper. Courtesy of the Sunday Post - a national newspaper. This is the road from Achnacarry to Spean Bridge as it crosses over the Caledonian canal. 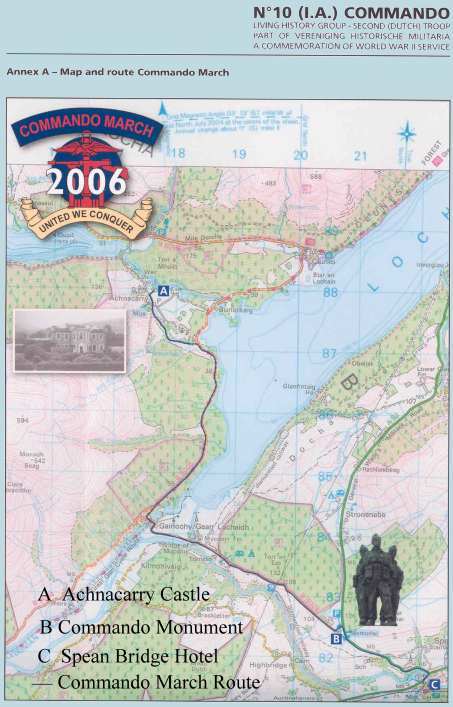 It will be recognised by any Commando or US Ranger from WW2 who trained at Achnacarry. In the front is Patrick van der Vegt, the organiser of the re-enactor's march and Pte Leslie Whipps of No 9 Commando. A lone Commando stands guard over the memorial prior to the arrival of the marchers at 12.15 pm. Although he morning parade at 08.30 am was taken in wet snow with thick low cloud overhead, a few hours later the clouds gave way to blue sky. 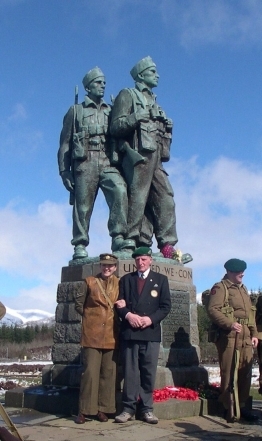 An informal photograph of the marchers with the Commando memorial in the background. CSM Peter Scally takes charge of the wreath laying ceremony. A wreath from everyone associated with the Memorial Fund and this website was laid by the great grandchildren of a Combined Operations Veteran - the late Flt Sgt John Glen who served on FDT 217 off Normandy. The sacrifices of the 1700 Commandos who died in WW2 is captured in this photo. 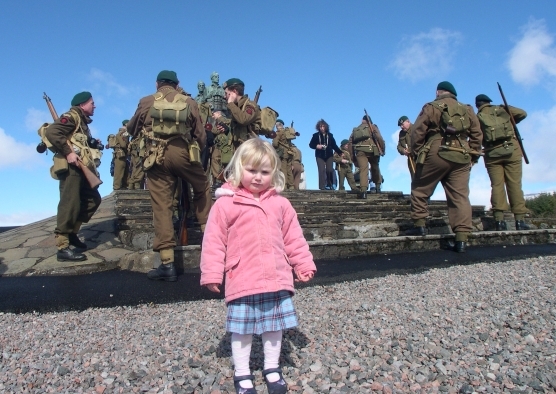 The child represents the future they fought and died for, the Commando marchers represent the present generation paying their respects and the Commando Memorial represents an earlier generation who did their duty. The amazing Pte Leslie Whipps of No 9 Commando. He completed the march with panache! He is over 80 years old and such was his modesty that he could not understand why he was given the seat of honour at the 'regimental' dinner held later in the day!